Jonah Lomu's 15 World Cup tries have secured his place in our World Cup XV, but who else has made the cut? It’s a thankless task tackling the sports fans’ most-heated debate –- picking a greatest ever team. There is never a correct answer; facts are ignored, personal favorites picked and style preferred to substance. It’s always subjective. So, I preface my selection of the best rugby World Cup XV of all time by saying that this is very much a side that I would want to watch. As a journalist, you need to think about balance and neutrality, but I’ve indulged myself here. For me, sport at its most uplifting is about grace and poise, the balletic as well as the brawn; I like to see athletes make the mastery of their game look easy, as if they were born to do it. My ultimate World Cup XV has plenty of grit but, above all else, these players would be entertaining to watch - simple as that. Huge for a front rower. Tall and powerful, and a double World Cup winner. Hard to argue with that. A leader on the field and part of New Zealand’s only World Cup winning team. Fitzpatrick was a great reader of the game and has proved that as a pundit since retiring. Embraced the sport’s race towards the notion of total rugby. In England’s 2003 World Cup triumph, Vickery showed that props could play with the ball in hand too. Hard to overlook John Eales but Matfield’s athleticism –- especially in the lineout –- just edges it. Key part of South Africa’s 2007 triumph. The heart and soul of England’s 2003 World Cup victory –- although he’d never agree. Led by example and intimidated opponents with his sheer presence. Still does. Maybe not the most inventive or skilful openside ever but this is a sentimental choice. Like Johnson, an inspirational captain and him receiving the 1995 trophy from Nelson Mandela is the most iconic image in World Cup history. Although he played at six in his prime, I wanted to make room for Pienaar and still include Jones. Adored in New Zealand, despite an injury-plagued career, he set the mould for the modern, rampaging back row forward. Like his contemporary above, Zinzan Brooke is rightly regarded as a legendary All Black. He played in three World Cups, combining fearlessness on the field with speed and sublime rugby skills. Tenacious and quick, Gregan has played more World Cup matches than any other Australian. Often an attacking spark in his country’s victorious 1999 campaign. This won’t be popular with the Jonny Wilkinson fans but, Lynagh’s play was easier on the eye. Just as reliable a kicker as England’s 2003 talisman, Lynagh also has four World Cup tries to his name. Rugby’s first global superstar and scorer of 15 World Cup tries, more than anyone else. 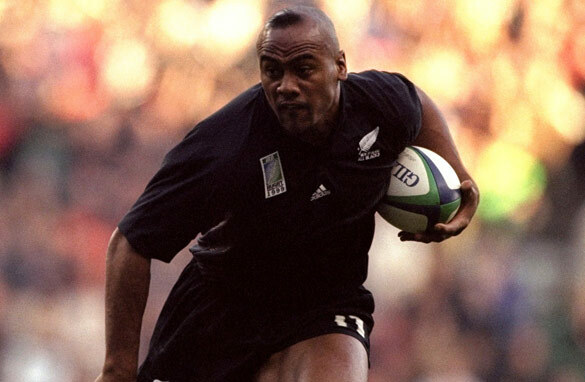 At the time, his sheer size was unique for a back and only Lomu’s health problems prevented him making an even bigger impact on the sport. Small but not for the era he played in, Horan had a recurring knack of spotting gaps in the opposing midfield and using an impressive burst of pace to exploit them. Guscott never ran across the pitch, he glided. A joy to watch, which is why he gets the nod ahead of fellow Englishman, 2003 World Cup winner and scorer of seven World Cup tries to Guscott’s four, Will Greenwood. Strictly, a right winger but Campo could almost go anywhere. The ultimate love him or loathe him player. Attempted things on a rugby field that no-one else would, and not always successfully. Bagged 10 World Cup tries in total. Sheer, gallic class. Like Campese, a rugby maverick. Blanco smoked like a chimney, and could fuddle the opposition with a silken touch, pace and vision. Crucial in France’s path to the 1987 final. I agree with almost every name, however I would have seen Philippe Sella instead of Jeremy Guscott, although Sella wasn't as good during the RWC as he was in other tournaments. Really.... Francios Pienaar over a much more effctive and dominate flanker in Richie McCaw from New Zealand? Great team although I feel bryan habana should be a feature. No John Eales in the 2nd row? Your selections will have no credibility in Australia...Eales was ten times the player Martin Johnston was and won 2 World Cups, captaining the 1999 team. Don't get caught up in the Pommy hype, Eales should have been named beside Matfield. And Guscott...you are so funny! Englishman Richard Hill should replace Pienaar and Joost Van De Westhuizen should repleace Gregan. Otherwise not a bad choice. Scrum half: Joost van der Westhuizen instead of George Gregan. 190 career points ( 98 caps ) vs. 99 career points ( 139 caps ) for their national teams. The teams looking good. Could offer a couple of minor suggestions. Andrew Mehrtens for "#10". Howeer i see there should be a balance of representation of Nations in the "World Rugby Dream Team". A couple of minor issues with Your Numbering ond positions in your Team above?!! you've got the two wings back to front. #11 is the Left Wing and #14 is the Right Wing. Was watching the world sport broadcast a few minutes ago and one of your presenters described the "Haka" as a Maori Dance which is incorrect, if you investergate you will find that it is actually a group challange or kind of "war dance"(all so incorrect as it can be done as a form of powerful respect if done at a gathering or funeral) Hakas are done by many nations in the pacific although named differently. Historicly done by each side before a physical conflict. Generally including men, although when women are included it adds a huge amount of depth of meaning, other than strength of challenge. I wish Michael Lynagh could play for Australia today. His kicking consistency is sadly missed. Nice selection. Ludicrous to play Michael Jones out of position. Not really happy to have any Poms in the team, but I suppose if you insist. Good squad, Gregan is good, but Joost van der Westhuizen was miles better in all the matchups. Joost was also more influential in a team context. Remember, he was the only player in 95 that could stop Lomu. I would also prefer Sella to Guscott. IT's nice to see CNN have some decent Rugby coverage for a change. Please do not abandon post RWC. North Americans are desperate for coverage. Cover college and super league in the USA and University and Provincial in Canada! Jonah was a left wing and Campese was on the right. Also, you can't deny Christian Cullen as the worlds best fullback, despite being overlooked by John Mitchell in 2003. Carter or Wilkinson are both superior to Lynagh. Just a note Openside would be Jone's (7) .. the convention in most countries is 7 = openside not 6, that is a South African variation. I would also suggest McCaw is superior to Jones in the modern game. Do you plan on doing a similar list for greatest RWC games of all time? I had a chance to meet John Eales at Ruggerfest in Aspen last year. For one of the games all time greats to take time to talk to an American rugby fan, I found him to be just a really, really nice guy. A pretty good World Cup XV. I like some of your choices. Joost van der Westhuizen, arguably the greatest scrum half of all time! John Eales? Well done on the rest of the team. Love the anti English comments from the Kiwis, how about John Gallagher, the englishman who helped you win your only World Cup in 1987? It's a great selection. I wonder what it would look like in 20 years from now. After watching the Russia USA opener , I was very surprised at the quality. They should start an Northern Pacific comp to match the likes of the 6 nations and the new southern hemisphere 4 Nations. Countries could include Canada,USA,Russia,Hong Kong, Japan . What do you think.? It's all very subjective isn't it? It's good to see that CNN is providing good coverage both here and on TV. o`driscoll won player of the decade.....maybe not in rwc but definitely better than guscott.....richie mc caw ????? In my country they don't show the rugby worldcup,but it is very interesting for me to see (on worldsports) or read(internet) about it. If you are looking for sheer presence or intimidation how about Willie John McBride? The Irish Lions captain for the South African tour in the early seventies. And what about Ollie Campbell, Keith Wood and Brian O'Driscoll? As the biggest news agents of the World i think you guys are putting on a really bad show of showing the Rugby World Cup, with no live streaming or highlights ,etc.All you have are still pictures and old intervieiws, get with it please.!!! You can really tell the age of some readers by their comments. I agree with most of the suggestions made by other readers. John Eales. Definitely in place of Martin. Sorry Martin. Chris Cullen at 15? you're having a laugh. Serge. Always. If you don't think so, it's because you never saw him play. Same goes for Guscott. I agree with another that Richard Hill should replace Pienaar. For entertainment value, I'd also like to see Carlos Spencer at fly half. When he was in the mood for fun, he took my breath away! Interesting selections – most I don't agree with if it's to play in todays game. They simply couldn't keep up. Most played in an era when you played the game as a recreational sport – you still needed a job in order to pay the bills. Thats all changed now with professionalism. I've spoken with many All Blacks from the past and all without exception have said that todays game demands much more than was ever needed in their day. They would be the first to admit they never achieved anything like the levels of fitness that are required today – and most say they probably couldn't. John Eales has to be in. Jeremy Guscott? Also missed the great Argentine, Hugo Porta- an automatic selection and also Ollie Campell of Ireland. Would also question Vickery at tight head. Many more better than him. Correction. Ollie Campbell had retired by then. So, instead of Campbell, I would put in Johny Wilkinson. His inspirational presence and skill was the key to England winning the World Cup, not just that one kick. Lock (4 or 5) – John Eales has to be in. And Guscott – give me a break. I'd rather have Richie McCaw at centre is he can't make the forward pack. Richie McCaw only player EVER to win IRB player of the year not once, not twice but three times. Enough said? Anyway who is Alex Thomas ? Great looking team...best wishes to Jonah Lomu who is currently in hospital fighting against kidney failure. Kia kaha big man. Ritchie McCaw, Dan Carter, John Eales. Put these 3 in and you have a perfect team. Go the All Blacks, you can win the World Cup!!! Seen lots of these rugby world XV's recently and this is the best so far. During his pomp Guscutt was the only northern hemisphere player who could have regularly got into any southern hemisphere side. However, if you were to include current players Richie McCaw might get into an XV! No world team should be without Richard Hill of England. A truly great player. Ask any top player who would be in their world team and the the first name they'll say is Richard Hill. Dan Carter should be in there, a man who can have a big impact on a game. I'm with the Carter supporters. There hasn't been a 10 at a World Cup with anything like his quality. And Frank!!! Who scored the winning try against the Wallabies in the semi in '87. None other than the incomparable Monsieur S. Blanco. In any sport across the globe, the mighty New Zealand All Blacks are the most successful team. Richie for no 7 in the all time World XV. I think you are missing some players from Pumas, like Rodrigo Roncero as #1. Sella and O'Driscoll are better than Guscott, and Eales than Mattfield. Christian Cullen as a back, I would have thought. Where the hell is Gareth Edwards, voted the best player of all time 4 years ago, voted for best try of all time for the barbarians, im not even welsh but you have got to take you hat off to the older guys for making the game so beautiful, people like john daws, jpr williams, colin meads, willie john mcbride etc these players are legends people are just looking at the last 20-30 years, look longer when rugby was less complicated and more artistic. John Eales easily the first choice in the Second Row and Brian O'Driscoll is better than Guscott . Two obvious mistakes, obviously one can debate the flyhalf position aswell. theres no mention of tana umaga or colin meads or brian o'driscoll. why not. Joost vd Westhuizen was better than the mentioned scrumhalves even Fourie Du Preez was better than them. For 10. Stephen Larkham hello am I missing something here? Yes Johnny boot but against Wales in 2003 what happened? Oh Catt had to come and help him out. Inside center. Horan was great but Nonu add much more for me. Umaga or Nonu thank you very much. Wings Wilson and Habana. Hendricks made Campo look like a bum running round him. He also played in a boot every third ball era. Wilson and Habana was/is quick and solid on defence and counter. 15 Christian Cullen. Enough said. Jonah was the first superstar but his carreer ended prematurely. An all time world cup 15 yea? .Where's the 3 greatest players of the last generation Macaw, Carter and O'Driscoll . Caucau and Lomu should be no brainers on the wings. They are outliers in the sport of rugby. Nobody else was really as naturally talented as them, nor scored as exciting of tries in the World Cup.